On Saturday September 16th, the District Department of Transportation (DDOT) and the Federal Highway Administration (FHWA) welcome public participation in their Environmental Assessment (EA) of possible improvements to Southeast Boulevard and Barney Circle. Learn more about the project and provide feedback to the project team. Commonly referred to as the Southeast Boulevard Project, the EA will evaluate conversion of the existing facility into an urban boulevard consistent with the expected travel demands and the character of the adjacent neighborhood. As part of this evaluation, the EA will consider natural, cultural, and human environmental resources, as well as possible resulting local and regional travel changes. The more than half-mile, four-lane road between Barney Circle and 11th Street SE (see above map) was known as the Southeast Freeway until its removal from the Interstate Highway System and reclassification in 2012. 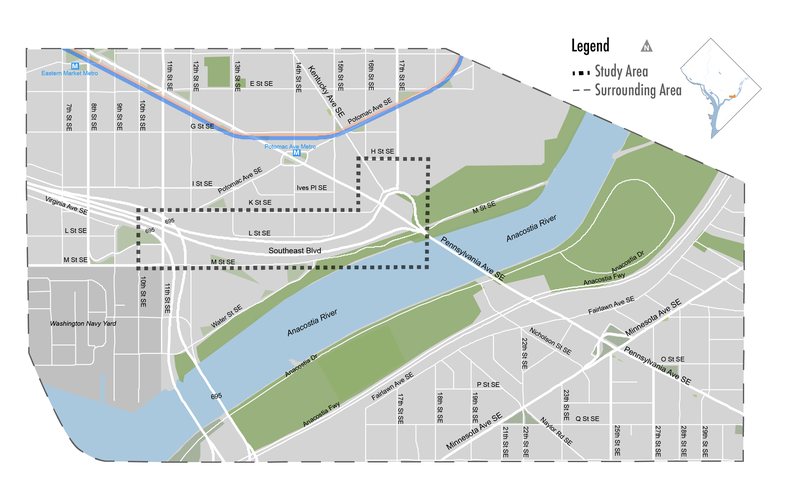 This change offers a chance to reimagine the boulevard and circle, while advancing the District’s larger Anacostia Waterfront Initiative (AWI) Program goals for improved multimodal access and community redevelopment along the river. Feedback is welcome. The first public meeting will take place from 10 a.m. to 12 p.m. at Chamberlain Elementary School (1345 Potomac Ave. SE), or contact the project team.